Product News: We've begun shipping an updated version of our Vetro timeclock. These new clocks contain an internal battery that keeps the Vetro's internal clock running if you lose power. Our previous version did not have an internal battery, so the clock's time would have to be reset after an outage. Our customers asked for this improvement, and we responded—at no additional cost. As always, all the data collected by the clock is always safe if there's a power outage: It's stored in non-volatile memory. However, if you have a power outage, your employees still will be unable to clock in or out unless you have an external battery powering the system. We sell such a battery—our Vetro Battery Backup—which is perfect for Vetros that are not part of a network. For clocks that are part of a network, you can use the Battery Backup or, if you use an Uninterruptible Power Supply (UPS) at your server, you can use our our Power Over Ethernet Kit. You can purchase a complete Vetro Starter Kit here or individual Vetro clocks here. If you use another TimePilot timeclock system, you can add a Vetro clock to it easily. Contact us at sales@timepilot.com or 630-879-6400 to find out how. Heeeeere's Johnny! : The phrase "a New York minute" refers to a very short period of time or an instant. It was popularized by talk show host Johnny Carson, who joked that a New York minute was the time between a traffic light turning green and the car behind you honking its horn. Tune in to tune up: Modern American orchestras generally tune to a particular musical note, A above middle C, which is set at 440 Hz and played by the oboe. Since 1936, U.S. time and frequency radio station WWVH has broadcast such a signal at the first minute past every hour to aid orchestras in their tuning. TimePilot Q&A: One PC, 2 companies; different kinds of transactions. TimePilot Lead Story: More "Off-the-Wall" Ways to Use TimePilot. TimePilot News: Vetro gets an internal battery. For other ‘off the wall’ uses, please see this article, this article and this article in past newsletters. For Accountants, Attorneys, Architects, Consultants, etc. Most TimePilot timeclock systems are purchased by companies to track their employees who are paid by the hour. But employees in the “professional services” sector—lawyers, accountants, architects, engineers, etc.—need to keep track of the time they spend working on individual projects or dealing with individual clients. One of the biggest culprits is email: Few professionals take the time to track how long it takes to read and respond to an email from a client. They commonly use once-a-week timesheets to track their client and project hours. One report, titled "Workers Are Bad at Filling Out Timesheets, and It Costs Billions a Day," (read it here) has found that system to be so inaccurate that businesses are losing an average of $50,000 per professional per year in billable time. TimePilot products can be used to solve this problem at a low cost. Acme Law Firm has 15 attorneys, each with multiple clients. Each attorney owns an iPhone or Android smartphone. The law firm purchases a copy of TimePilot Enterprise Edition software for $319 and has each attorney download a copy of the free TimePilot smartphone app from Apple’s App Store or Google Play. Instead of entering employees in his or her app, each attorney enters their clients. When they start dealing with a client’s email or the client calls, they “clock in” the client in the app with a tap on their phone’s screen. When they finish, they clock the client out. 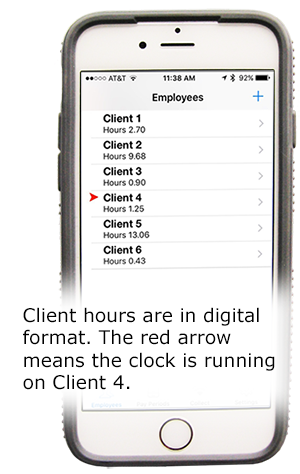 Each week, they tap an icon on their phones to send their accumulated hours to the firm’s billing department. The TimePilot Enterprise Edition merges all the data and generates the amount of time to be billed to each client. A variety of other reports can be also created, including the number of billable hours by attorney. Patrick Meraz is an electrical engineer with a one-man consulting business. At any one time, he has five or six clients and/or projects. Every Friday, he enters into a spreadsheet what he remembers of their billable hours for the week. He knows he’s underbilling his clients, but cannot find a better way. Then he tries the free TimePilot iPhone app. He enters his clients into the app, and when he starts work on a client’s project he “clocks in” the client; when he stops, he clocks them out. On Fridays, his app has the total hours spent on each client ready to go. He copies the numbers to a spreadsheet for his records, and he’s done. In the future, he plans to purchase the TimePilot Enterprise Edition software so he can generate reports and “drill down” into his data, but for now, the free app is enough. Larry Jackson is a high school football coach. His players have two “off-field” responsibilities: weight-training three days a week and 3 hours of team volunteer work each week. Larry buys a TimePilot Tap+ clock and an iButton for each of his players. Some players keep their iButtons on their keychains; others on their lanyards. Larry adds a patch of Velcro to the back of the Tap+ clock and attaches it to the wall of the weight room. The players clock in with a tap when they enter the weight room and clock-out with a tap when they leave. There’s no need for an assistant coach to “babysit” to make sure all players do their lifting. On weekends, an assistant coach supervises each volunteer project. He takes the Tap+ clock off the weight room wall and brings it to the site. One week, the team spends its time clearing a vacant lot for a neighborhood garden. When the players arrive at the site, they clock in; when they leave, they clock out. At any time, Larry can plug the clock into his laptop computer and within seconds he can see which players are putting in their time in the weight room and at the projects and which ones aren’t. For more information on how TimePilot products can be used, contact our Sales Department at sales@timepilot.com or 1-630-879-6400.